Here is the article to go with this pic , provided by the NT News website , enjoy ! A MAN caused a stir on Top End streets yesterday by cruising around on a motorised scooter wearing just a mankini. The red-headed, tattooed man stopped traffic and turned the heads of many Saturday morning shoppers. He was wearing a slimming black mankini, shoes and a helmet. NEWSBREAKER Camden Smith captured this photo of the irreverent motorcyclist at 9.45am yesterday. Mr Smith was driving along Bagot Rd and came up alongside the man at lights. A 28-year-old Darwin fashion identity, who asked not to be named, saw the man just minutes later in the centre of Darwin. “He was motoring gleefully through the crowded CBD streets, stopping onlookers in their tracks, with so much flesh on show,” she said. “He really looked like he was enjoying himself,” the eyewitness said. “I thought he must have been wearing his mankini to feel comfortable in our hot, wet conditions. 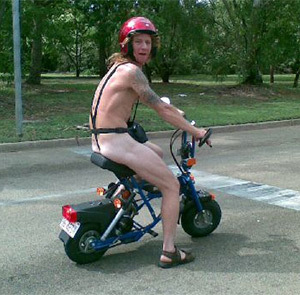 The motorcyclist is not the first brave Territorian to slip into the revealing one-piece made famous by Sacha Baron Cohen’s character Borat. “Mr Mankini” famously streaked across TIO stadium at the AFL Bulldogs and Fremantle clash in June 2007. The man, sporting a fetching blue mankini, had the 11,000 strong crowd hooting and screaming as he outran security. The crowd leapt to his defence when he cleared the fence, some by throwing him clothes, others by pinning security guards to the fence so he could escape. Holy crap. You have got to be kidding me! That’s a first! And to think I had never even heard of a mankini. Great one, Kel! Happy Monday morning to you. Apparantly its a very poular item of clothing for local fella s up here 😉 It first came out when Sacha Baron Cohen (Ali G) wore one for his movie Borat …. I kind of wish he hadn’t started this craze , it isn’t the most flattering swimsuit a man can wear !! !